Use to raise track on approach to bridge. Snap-fit mounting for Atlas track. A great detail for any roundhouse or engine service area. Model comes fully assembled with a 7-1/2″ diameter deck. Serves up to 24 tracks, with 15″ spacing. Designed for use with Atlas Roundhouse #150-2843 and can be motorized using motor kit #ATL-2791. 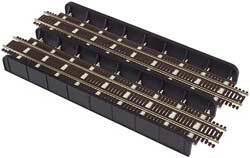 Protect a junction, yard or other busy trackage along your line. This handsome American building is packed with details, including intricate inlaid bricks, drain pipes and eave supports. For the area around the tower, a tool shed, oil tank and barrels are included. This charming home is perfect for any family and fits city or country scenes. The structure features clapboard siding on lower half and shingle detail on the upper half. A brick chimney, rain gutter and down spout detail, window glazing and an authentic Bilco(R) cellar door are all included. This model is a full scale replica of a depot built by the New Jersey Midland Railroad (predecessor to the present-day New York Susquehanna & Western Railway) at Maywood, NJ in 1872. Stations built to a similar Victorian-era design could be found in small towns and suburbs of larger cities on railroads across the US. Modeled after a popular catalog home of the 1920s, Kim’s Classic American Home is the third release in the Lovely Ladies Home Series™ from Atlas Model Railroad Company. Each package includes 2 garage structures and comes with a detailed instruction sheet for easy assembly. 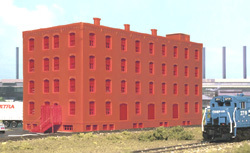 Based on the original four-story brick building, the Middlesex Manufacturing Company features eight chimneys, a loading dock, elevator tower and entry stairway. On the track-facing side are several loading doors for boxcars to load and unload their freight through. Optional window blanks to brick out the windows and window vents will be included with the model.